There are Chicken Tacos and there are Chorizo Tacos. Put them together and you get Chicken and Chorizo Tacos! 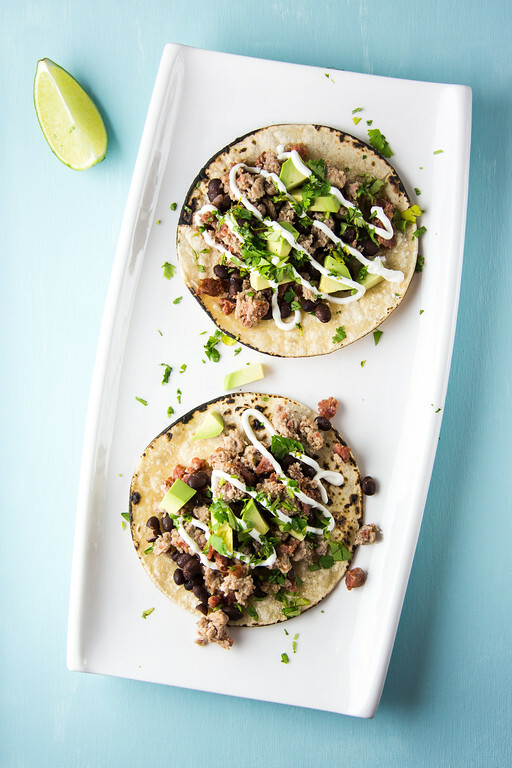 Ground chicken gets a flavor boost from the chorizo in these easy and delicious tacos. Post may contain affiliate links, full disclosure on sidebar. Lately tacos have become one of my favorite foods to cook. 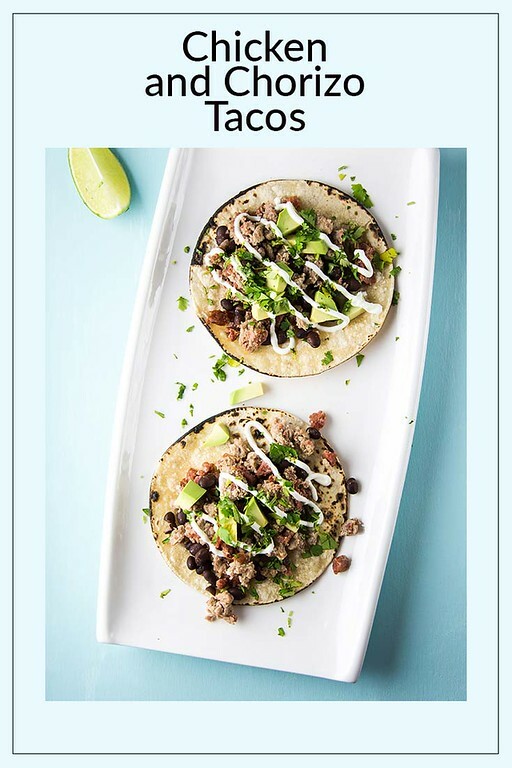 Tacos were probably one of the first things I ever cooked, though I confess that I used one of those taco kits, that comes with everything but the ground beef, you know what I’m talking about. Nothing wrong with those at all. I’ve rarely met a taco that I didn’t like. However, I have discovered a whole other world of Tacos. 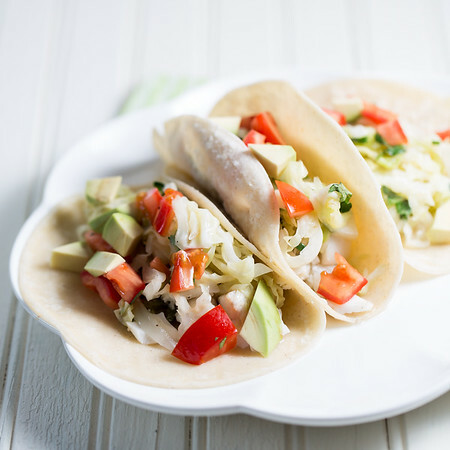 Click here to pin these Chicken and Chorizo Tacos now! I like to have a take away from a recipe. An a-ha moment. A why-didn’t-I-think-of-that moment. 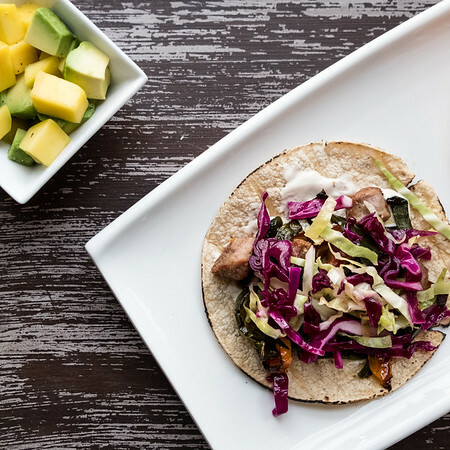 This chicken and chorizo taco recipe had a big one. A one that I am going to use as often as I can. I love dry cured Chorizo sausage. I always thought it had limited uses because it is so tough and chewy. Well, leave it to Donna Hay to come up with the perfect solution. You just chop up the sausage and put it in a food processor and process until it’s finely chopped! It’s perfect. It gives you little chewy, spicy bits of sausage with go perfectly with the mild ground chicken. Genius! I found this recipe in the Donna Hay Feb/Mar 2015 issue. The only thing I did differently is that she said to use the black beans as a topping and I just went on ahead and stirred them into the chicken chorizo mixture to let them warm up a bit. 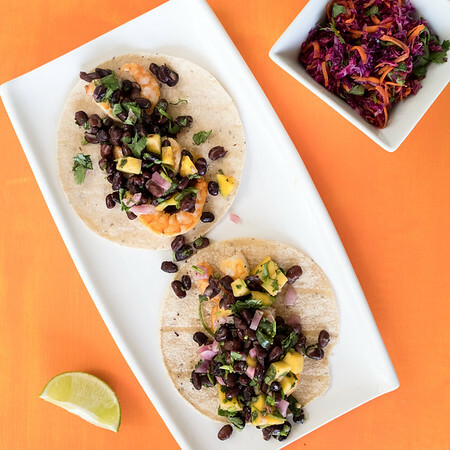 You seriously have to make these tacos. They are so good. And ready in easily under 30 minutes! Using dry cured Chorizo sausage and finely chopping it in a food processor is a complete game changer in these Chicken and Chorizo Tacos. Place the chorizo in a food processor and process until finely chopped. Heat the oil in a large frying pan over medium high heat. Add the chicken, chorizo, garlic, chile pepper flakes salt and pepper. Cook, breaking up the clumps with a wooden spoon, for about 15 minutes or until chicken is cooked through. Stir in black beans. Divide the chicken mixture between the tortillas. Top with the avocado, sour cream and cilantro. Serve with lime wedges and chili sauce. These look great! I haven’t made much with chorizo. Your Chicken Chorizo Tacos look delicious! Thanks so much for sharing your post with us at Full Plate Thursday and come back soon! Your Chicken and Chorizo Tacos really do look wonderful, Pam. Love all the flavours you have used. Hoping to give these a try soon! Thank you for sharing with us at Hearth and Soul. Scheduled to pin. We love chorizo, my MIL brings us fresh chorizo and in fact we had it for dinner tonight. We make chorizo and egg tacos but a local restaurant makes a fantastic grilled chicken and chorizo burrito that my son orders every time we go. Your recipe reminds me of that and I really need to try it out. Thanks for sharing with Small Victories Sunday Linkup. Pinning to our linkup board and hope you found some great posts to visit this week! These look delicious. I love your whole blog and your photography is amazing! havne’t had much exposure to Mexican food but these look delicious. I think chorizo improves anything it’s paired with, but then so does bacon. This is the kind of family dinner we love! Looks great! They look like the ones I used to get in Austin TX! Look very yummy! Love chorizo for the flavor bomb it adds. Have never tried the cured but will give it a go. I love all the flavors! Yum. I think I could make it with ground turkey too. You should come link this up at Welcome Home Wednesdays! Party is open.